The goal of the measurement was to investigate a larger tree structure of a real-life network, in which the internal time delays can be resolved from the end-to-end packet-pair travel time distributions. In the measurement the Eotvos University (Budapest) node was the sender. Three pairs of gps synchronized destination nodes were chosen (see the table for the details), each of which 10000 back-to-back packet-pairs were sent to in a round-robin fashion. Between the measurement packet-pairss 0.01 s delays were kept to avoid buffer overflow caused by the measurement stream. The sending of the probes were accomplished by the network interface, the capture was done by DAG cards. A trigger packet was sent to the DAG card of the sender machine to be able to determine the precise time of sending the packet pairs. # - The id of the packet pair. Hops - How many hops the destination is from the source node. The resolvable inter router hops are also indicated. Edges - How many routes rosolvable are there. 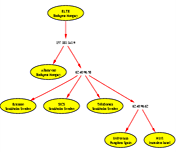 The tree structure of the network was decomposed to have 3 peaces of Y-topologies, each dressed up with two series of one-way-delays from the packet-pair data. Using the tomography technique the distribution of the delay fluctuation on each edges were determined. Then for the remainder edges data could be mined using deconvolution. After the analysis for all the 9 edges we had the delay distributions. (For a larger view click on the image.) We may conclude that between the routers where the number of hops are the fewer, the distribution the narrower.